The Practical Art of Suicide Assessment covers all the critical elements of suicide assessment-from risk factor analysis to evaluating clients with borderline personality disorders or psychotic process. This highly acclaimed text provides mental health professionals with the tools they need to assess a client's suicide risk and assign appropriate levels of care using the highly acclaimed interview strategy for eliciting suicidal ideation-the Chronological Assessment of Suicide Events (the CASE Approach). SHAWN CHRISTOPHER SHEA, MD, is a nationally acclaimed workshop leader and educational innovator in the field of the initial diagnostic interview. He is the author of the bestselling text Psychiatric Interviewing: The Art of Understanding, Second Edition. Dr. Shea has received an Outstanding Course Award from the American Psychiatric Association for his presentations at its annual meetings and has presented at both the Cape Cod Symposia and the Santa Fe Symposia. He is an Adjunct Assistant Professor in the Department of Psychiatry at the Dartmouth Medical School, Hanover, New Hampshire, and is also in private practice. I have not finished the book, but as a clinical therapist, I tend to never really finish a book but use as a prompt for thoughts, to help me focus on as I adjust methods of approach with various patients. I find this book helps me do that from time to time. I wish I had time to give it a complete read through but running a practice makes that not a practical option. That said, I do want to give the author credit for what they have done here. It is worth buying. I think as practitioners we can all gain from. just prompted thoughts as needed may lead to asking questions and attention to a detail we may otherwise have missed even if just in part. I think its a great tool for revising your own assessment tools! I don't know why they didn't make us read this in training, I read it in a weekend, and I'm so glad I did. It has some of the best practical advice I've ever heard with regards to understanding suicidal thinking, evaluating for suicidal ideation, and making decisions about treatment. You can put the principles into practice immediately, before you even finish the book. Serving a clinical mental health population with significant suicide risks involves engaging several basic therapeutic models on a regular basis: e.g., CBT, DBT, Motivational Interviewing, crisis assessments and interventions with medical facilities and agencies. Shea's guide wraps around clinical, social and statistical theory in a way that helps clinicians identify subjective events to sort out different levels of risk factors, so as to better assess and help suicidal clients. Lots of specific examples and support knowledge. Shea has designed an interview system (CASE) that helps the clinician to elicit important information and assign appropriate interventions and care. He also emphasizes particular values in documentation of services clearly and precisely with a view to protecting both clients and providers. A valuable resource asset for the clinician. 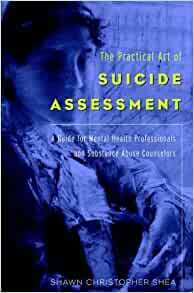 Indeed, suicide assessment is an art, and this book certainly helps the mental health professional hone their assessment skills. However, the best part of the book is it's "readability". Most clinical books are at best dry and sometimes boring, This is a very easy read and quite interesting, even for the non-professional. I recommended to all. Love this book and have been extremely happy to find this collection in your inventory. Especially at this price. I've found it in many bookstore for considerable more money. As the title suggests, this is full of very practical and important information about how to create a safe atmosphere for clients to share possible thoughts of suicide and what degree of intensity and risk may be present. Great examples of counselor/client dialog and exchanges. this book is for school. however, it is a very easy read and very useful for learning how to look for suicidal tendencies in a person. Dr. Shea shares great insights into the interview process for suicidal patients. Too often there is a reliance on demographic or symptomatic factors to determine suicidal risk. Dr. Shea convincingly brings us back to the realization that suicide is an individual choice and the risk of suicide can only be estimated by understanding the individual's thought processes regarding suicide. Theorectically sound and practical book.